NETWORK FINALS: All of the networks saw bumps in their DEMOCRATIC NATIONAL CONVENTION coverage: NBC and CBS each by 0.2 (to 0.9/0.6 respectively), and ABC by 0.1 (to 0.8). In addition, BIG BROTHER, AMERICA’S GOT TALENT and the 8PM GOLDBERGS and BLACK-ISH reruns gained 0.1, while AMERICAN GOTHIC, THE NIGHT SHIFT and the full CW line-up (PENN & TELLER: FOOL US and WHOSE LINE IS IT ANYWAY) lost the same. CABLE HIGHLIGHTS: See Mitch Metcalf’s Convention Ratings Analysis post for more detail on last night’s coverage. In broad strokes, it was another big night for CNN, which had 5 of the Top 10 pieces of programming for the night, topped by the 11PM hour (the bulk of President Obama’s speech) at 1.47. MSNBC was again in 2d position, with 3 shows in the Top 10, also led by the 11PM hour at 0.91, and once again, FOX News viewers spent the evening doing something else, with 0.42 in its 11PM hour. A special HBO hour of REAL TIME WITH BILL MAHER was at 0.15, better than the night’s ANY GIVEN WEDNESDAY at 0.08. The highest-rated non-convention programming was OWN’s GREENLEAF, down 0.03 to 0.61. On Lifetime, LITTLE WOMEN LA rose 0.12 to 0.58, and LITTLE WOMEN ATLANTA was down a tick to 0.48. On USA, SUITS gained 0.05 to 0.54, but MR. ROBOT continued downward, in what must be a sharp disappointment for the network, off by 0.04 to 0.26. 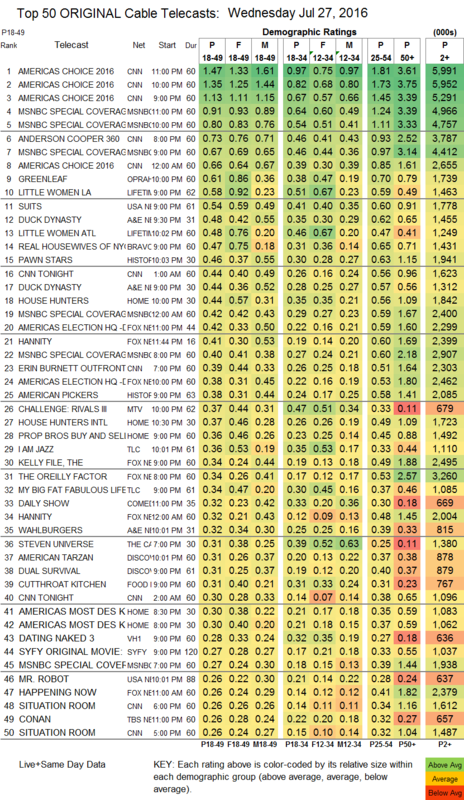 A&E’s DUCK DYNASTY was at 0.48/0.44, compared to last week’s pair of 0.42s, then WAHLBURGERS was up 0.02 to 0.32, and BLACK & WHITE premiered at 0.13. Bravo’s REAL HOUSEWIVES OF NYC lost 0.02 to 0.45. On History, PAWN STARS was at 0.46, and AMERICAN PICKERS was at 0.38. On HGTV, HOUSE HUNTERS was at 0.44, HOUSE HUNTERS INTL was at 0.37, PROPERTY BROTHERS BUY AND SELL edged up 0.02 to 0.36, and AMERICA’S MOST DESPERATE KITCHENS was at 0.30/0.30, up from last week’s 0.24/0.23. MTV’s THE CHALLENGE dropped 0.07 to 0.37. On TLC, I AM JAZZ gained 0.04 to 0.36, and MY BIG FAT FABULOUS LIFE held at 0.34. Discovery’s DUAL SURVIVAL was up 0.03 to 0.31, and AMERICAN TARZAN climbed 0.04 to 0.31. Food Network’s CUTTHROAT KITCHEN ticked up to 0.31. VH1’s DATING NAKED was steady at 0.28, and BARELY FAMOUS added a tick to 0.10. 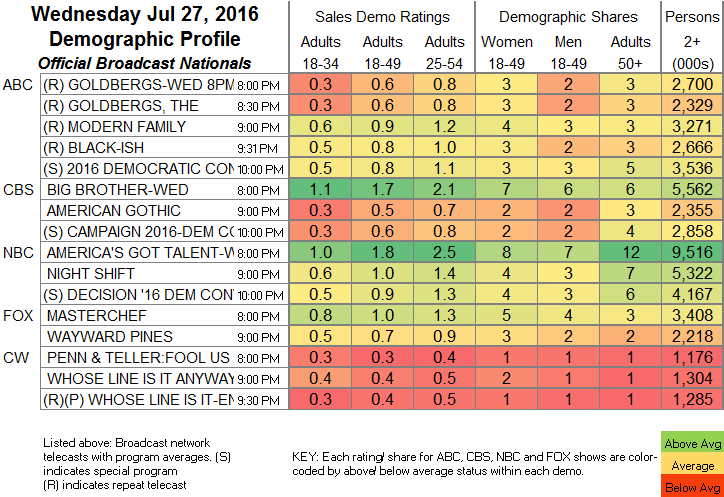 On Freeform, YOUNG & HUNGRY moved up 0.02 to 0.25, and BABY DADDY fell 0.04 to 0.21. Comedy Central’s ANOTHER PERIOD lost 0.02 to 0.19. FX’s TYRANT held at 0.19. Sundance’s THE A WORD was steady in viewers but down 0.1 in the demo at 0.01/48K.